Does the thought of starting your own Sourdough Starter from scratch make you break out in cold sweat? Don’t let it because it’s EASY! Looking at the blog’s stats, there’s a constant stream of people who pop in here searching “sourdough starter” and it is becoming apparent that it may be helpful for me to finally get one written up. Instead of starting an experiment “from scratch” and sort of poking my way around the technique and making a lot of guesses, good or bad, in the process, I figured it would be more logical to take a very well researched and detailed account and simply follow along, giving an illustrated account of what’s happening in my kitchen. After doing a fair bit of searching, I have chosen to follow a formula designed by Debra Wink who is not only an excellent home baker but also a trained microbiologist. The combination of interests seems to me the best source of information to get both the “what’s actually going on in that paste” and “this makes great bread”. 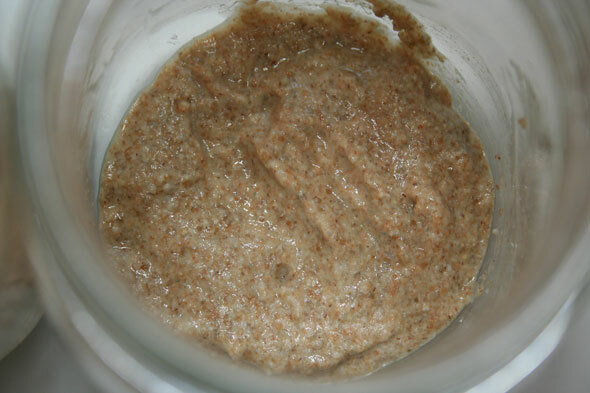 A simple flour and water paste can be made into a sourdough starter but offers a good environment for much more than the specific strain of yeast and bacteria we desire; these other organisms can impede the growth of our “friendly” critters and make the actual development of a viable starter take much longer than it needs be. Primarily, the formula introduces an acid, in the form of pineapple juice, which immediately lowers the pH of the flour paste to levels appreciated by the yeast and lactobacilli, the two friendly critters we want to cultivate. This jump starts their development – although the yeast will likely not awaken for several days yet – and get you to the end product you want much faster by skipping the confusing 1st stage growth of other bacteria, the foul smells and other distractions you might see in a plain flour-and-water medium. For a VASTLY more in-depth description of “what the heck is really going on in there”, I’d suggest you take some time to read Debra’s blog posts on TheFreshLoaf, located here (part 1) and here (part 2). Be sure to also read the comments/Q&A under these posts as much more info and FAQs you might be wondering about are addressed there. For this project I’m following the instructions in Debra Wink’s post over on TheFreshLoaf com . Please make sure to read it and even print out a copy so you can follow along. I’ll also build two versions of the starter at once: one with juice and one with plain water, side by side, to make comparison easier. I also thought a Starter Step-by-Step would be helpful for those people taking part in the Bread Bakers’s Apprentice Challenge (who don’t already have a starter going) to have at hand as we near the Sourdough section (albeit that’s not due until December). Because you do want to give your starter some time to mature, it may be a good idea to fire this puppy up at least a month or two ahead. And it also gives you a starter to play with and make great bread, even before you get to the Sourdough recipes in BBA. Although Reinhart has instructions in the BBA for starting a starter (which he incorrectly calls “barm”) there have been problems reported with those instructions. This is, in part, what prompted Debra Wink to do research noted above. But what we have here is, it turns out, straight forward and simple to follow. Let’s get started, shall we? I’ll include the specific bits I’m following from Debra’s instructions as we go, that will be the RED TEXT while my own running commentary will be in regular text style. I will also split this up into separate pages for each day so it’s not too gigantic a post. Since I started the Bread Baker’s Apprentice I have been actively reading about sourdough starters. Very curious where your travels take you with this. I have actually started my first one but it ended up developing a very strong almost vinegar smell. Do you have any idea what could have caused that? I tried again and it seemed to work fine and has a good smell. The acidity in the flour soup is brought on by bacteria, including the ones we want, Lactobacillus sanfranciscensis. This is actually something you want to happen as the acid production is what lowers the pH to a level preferred by the critters we want. Had you kept the first batch going, it probably would have evened itself out once the yeast got active and the symbiotic relationship between our desired bacteria (the lacto) and the yeasts got more settled in and they were better able to control, along with your feedings, the environment that’s best suited for the pair. But if you started it all up again and you’ve got past that, then it’s somewhat academic. We’d need someone like Debra Wink in here to get into the nitty gritty and explain exactly who did what in your previous batch. I’ve been using KAF website as my only source of education/recipes. ferment for 2-5 days, stir down, and refridge. feedings of 4oz water to 1c (5oz/141g) flour (after discarding 1c). (8oz) . Does yours have that much? I won’t go into the issues I would see in the KAF starter formula and how it doesn’t even jive with Jeffrey Hamelman’s routine – and he’s KAF’s own master baker. So I’ll just tackle the following. Since you say you built the starter with 2 cups of water and 2 cups of flour, your actual starter’s hydration is close to 180%, a seriously wet and runny starter. 1 cup of water weighs 237 grams where 1 cup of flour is ~127 grams, so this ratio of water to flour is 186%, way too wet. What’s wrong with this? Simply, the starter is so thin that it can’t trap the gas bubbles produced by your little critter friends and these bubbles simply float to the top and pop. You won’t really get any expansion of your starter to help judge how active it is. Is that bad or wrong? No, not at all; the critters are just as active in this sort of starter as a thicker one, perhaps more so since they can zoom about a lot easier in the liquid atmosphere. It just really isn’t the consistency you’d see required in most recipes and you have no good way to judge how well it is actually doing. Although you’re reducing that starter to 1 cup, you’re not feeding it enough to give the yeasties enough food to keep going. And hungry yeasties make hootch. To a cup of that very wet starter (about 228g) you’re adding 118g of water and 141g of flour. This is a feed ratio of 1: 0.5 : 0.7 (or so) which is very low. We want to see at minimum a 1:1:1 ratio and better still 1:2:2. And remember that water isn’t food, it’s simply a medium for the yeast to get around in and consume the flour. Alternatively, your mix could simply be so thin that the flour just drifts down to the bottom and the water separates on top; you’re not actually getting hootch after all which means you actually don’t have much yeast activity going on. You might, but it’s not possible to tell. Here’s what you could do to solve both issues. Take 10g of your current starter (which is an unknown hydration but we know is “too wet”) and give it 20 grams water and 20g flour. Although we don’t truly know the hydration of that 10 grams, it’s going into a larger amount of flour/water at 100% hydration so eventually it will even out well. Now set this 50g of starter on the counter where it will be at approximately 21 – 23ºC (70 – 75ºF) and see when it reaches double size and when it (maybe) gets even larger. If it can do this in about 4 – 6 hours, your starter is good and lively. If it needs 12 hours to peak, it was still a little weak – and it’s a good thing it got a good feeding. When the starter has peaked – meaning it’s reached it’s max and juuuuust started to decline – reduce it again. In a new small jar, take 10 grams of this and add 20 grams each of water (stir) and flour (stir some more). Again, we have 50 grams of 100% (or close enough) starter. If you prefer to keep a 125% starter (say your fave recipes want 125% starter) then you’d do 20 grams flour and 24g water. With a larger 1:2:2 feed, your starter shouldn’t go hungry and develop hootch. You’ll also be keeping a more logical 100% (or maybe 125%) hydration starter which isn’t as runny and more likely to work in most recipes. And finally, by reducing your starter to about 50g, which is a bit under ¼ cup when just mixed, you won’t need to keep – and feed – 2 cups of starter. Thanks for the info! The starter did indeed seem very weird. Coincidentally I tried making one of their loaves with it (rising right now), and the dough turned out to be very wet. Had to add a lot of flour to make it workable. We’ll see how it turns out. I did a 1:2:2 feeding just now. Unfortunately I’m going out of town Friday, should I keep feeding it daily then on Friday throw it in the fridge? Hi Nick, very late reply here. Yes, feed it as normal – twice a day, breakfast time and dinner is close enough then pop it in the fridge when it’s close to peaking after dinner. It will be fine for the weekend in the fridge. When you get back home, take it out and feed it again using slightly warm water to take the chill off that small bit of cold starter. Continue from there as usual. First, thank you very much for helping me to make sense of sourdough. bread baker and some of the sites & info are very intimidating. have a few questions regarding the process. to AP, should I use a 2:1:1 or 1:1:1 ratio? should I do this before putting it in the fridge? 30:60:60 ratio for feeding (which looks like 1:2:2). help would be very, very much appreciated! Thanks for the kind comments. I did try to make it as accessible as possible because when I started with this, I was finding the same thing you did: lots of different, sometimes confusing and conflicting info. I also went through about 10 lbs of flour trying to get three different starters to get going, all to no avail. Then I ran into the Pineapple Starter instructions and I haven’t looked back since. I find that having a better idea of what’s actually going on deep inside the starter, even if not exactly at a biologist’s level, helps make sense of the process. On day 4 and repeating until you get activity (which may be day 5 or day 4.5 or 6 or 7), keep at the 2:1:1 ratio. Note that this could also be written as 1 : 0.5 : 0.5 ratio. Because the yeasts you want aren’t actually up and awake quite yet, you want the original soup to still be the main ingredient here, ergo the larger amount of this. In other words, you don’t want to dilute the minuscule population of your barely awake yeast buddies to where they can be overwhelmed by the introduction of other beasties. And you also want to keep that pH level in the original flour paste, which you’ve spend some time and effort to achieve, relatively steady; adding lots more ‘fresh’ paste would unbalance it too much. Now once you DO see some activity, then you can switch to 1:1:1 where these second and third 1’s are going to act more as food. When your yeasties are doing well and doubling that 1:1:1 mix in just a couple of hours, then bump up the fresh food aspect and go to 1:2:2 so your very active new yeast pals and their lacto cohorts have plenty of food to chow on. Once or twice a day feeds? You need to let your culture tell you that. At first, it won’t be very active and take several hours to double (or better) through that 1:1:1 ratio. But soon enough, it won’t take all that long and you can feed more (1:2:2) but that again slows things down since they have twice as much food to last them longer. But eventually, they’ll once again be active and hungry enough to get through even that 1:2:2 ratio well within 24 hours (once a day) so you can get their feeding schedule to twice a day, “morning” and “evening” being as accurate as you need to be. I did it in the morning before work, then around dinner. I didn’t look at the clock (“OMG it’s 7:12, I missed the feed by 26 minutes!”) Neither did the starter. Is 30:60:60 the same as 1:2:2? You are correct, 30:60:60g is indeed the same as 1:2:2, it’s simply noting the actual gram weight vs simply proportions. I’m currently feeding my starter at 10:20:20 grams (also 1:2:2 ratio), which makes less discard to consider if I happen to not be baking a sourdough that weekend. 10:20:20g also gives me 40 grams of excess to use in the bread which happens to be 10g more than what most Hamelman recipes need (30g) so I don’t even have to build that up. I would hold off switching your down to that small a quantity for a few weeks to a month until you know it is dependably consistent and predictable in its rise and fall. But you can certainly do so a little later on and save yourself a few cents and some flour when you do. How often to feed will also depend on the temperature you’re keeping your starter at; warmer, they’ll be more active and eat faster; cooler and they’ll ‘chill out’ a little. Generally, you will want them in the low to mid 70’s F (21 – 24ºC). If you’re in a warmer climate and are finding your kitchen in the mid to high 70’s or better, you may need to feed 3 times a day. There are other ways to maintain a starter but we’ll stick to the 100% hydration maintenance for the time being and not throw more confusion into the game quite yet. When can I get this starter into the fridge? Don’t be in a too much of a rush to put that new starter in the fridge just yet; it needs two (or three) weeks to get itself well settled. Yes, it will be able to be used in bread before then, after about a week of reliable, consistent activity, but it won’t be a ‘great’ starter yet. It will need time for your colony to get itself set up and robust. So it shouldn’t be getting sent to live in the fridge until at least two full weeks of good, strong activity, preferably three weeks. Even past that three week mark, it wouldn’t be a bad idea to take the starter out of the fridge, say Friday morning, and give it it’s twice-a-day feed on the counter for the weekend (while you’re home and about) and get it back in the fridge Sunday night or Monday morning. This will give it a few weekends to build up it’s character. You might want to do this for two or three weekends. 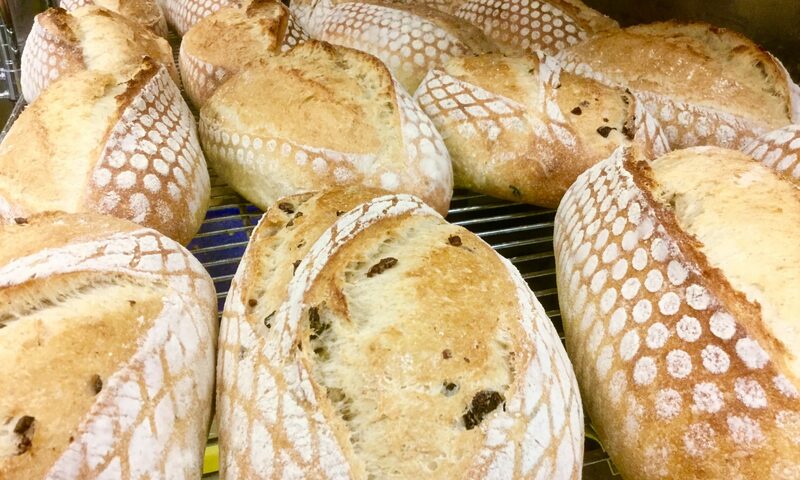 From there, just your normal weekend baking refresher feeds will keep it active and vital and build up it’s character and over time, it will get it’s own characteristics that make it “Matt’s starter”. I hope the above has answered your questions and I welcome you to add a reply if there’s anything I’ve left (or made!) unclear. Just post your comments under the “day” posts most appropriate to your own starter’s progress at that time and I’ll be happy to help you and your starter, [insert it’s name here], as best as I can. Pingback: …si mai multe despre maia | Apa. Faina. Sare. I’ve read all your posts on the starter, great job in explaining it so well! – I assume you refrigerate the starters since day 7. Do you still feed them twice a day with 1:2:2 ratio or is once a day enough? What happens if you forget to do so one time? Although your starter may have begun expanding to twice its size at each feed, day 7 is rather too early yet to put it in the fridge. Assuming it took just 4 days to go from flour soup to starter, it’s really just a couple of days old as a starter. It is generally recommended to keep the starter out on the counter for two full weeks – I would even prefer to keep mine out for THREE weeks – and feed it on a regular basis, so it can build up it’s strength before being subjected to hibernation, and also develop it’s particular character: flavour, expansion ability and so forth. This means that you’ll be babysitting a brand new baby starter for a while yet, feeding it twice (or more) a day, as needed. Three times if you feed at 1:1:1 since this is less food than a 1:2:2 ratio which could work on a twice a day schedule. “Morning” and “Evening” feeds are as accurate as you need to get here, so don’t get panicked if it’s 8:15 and you missed the usual morning feed at 7:30. On a three-times feed, morning (as in just before work), afternoon (home from work) and evening (before bed) are good enough. The starter doesn’t wear a watch so exact timing isn’t demanded. It is more affected by temperatures than a half hour here or there. If you forget a feed, it’s not a huge issue. Once starters get established after staying out with daily feeds at three weeks and older, starters are pretty resilient and can take some neglect without much problem. Of course, you don’t want to intentionally neglect it but forgetting a feed here or there isn’t the end of the world for your starter. Just get back to feeding regularly and carry on. The most likely thing that might really kill a well-settled starter is to accidentally bake it or someone throwing it out because “it was just a jar of stinky goo in the fridge”. So when your starter is ready, it can go in the fridge and stay in there for a week, getting pulled out and starting the “refresh” feed two days before you plan to use it. You do not need to feed it when it’s in the fridge, otherwise you may as well keep it out on the counter, right? 1) Thursday morning: Take the starter out of the fridge and, using warm water to offset the cold starter, feed as you would normally. 4) Friday evening, feed the starter one more but use the excess to build up your desired levain for the recipe. Feed your Mother starter and in a couple of hours, when it’s well on it’s way but NOT yet peaked, back she goes in the fridge until next bake time. Your “levain build” can then stay out overnight and should be ready to go into the dough in the morning. Note that you never used your actual starter “mother” in the dough, always use the excess. This way you never accidentally use all the starter up and bake it. This is a pretty huge reply to your pretty small questions but I hope it really answers these and a few more subsequent questions. If there’s more you want to ask, pop into the appropriate day’s post you’re on and ask away! 1) The temperature is near perfect for keeping the levain safe, according to R. Clavel who recommends around + 10 C. The cooler offers + 8 C at the warmest. I can’t get it to go over that temperature, to the ideal + 10 C. But + 8 C is not bad. My fridge runs at + 5 C, which although perhaps adequate for the levain, is not ideal. 2) In such an environment, I had kept my youngish levain (about 4 weeks old when I acquired the cooler) and I do not need to feed it for 4 days at least even though it manages to more than double its size in there. I have not gone more than that till now so that I don’t know whether I could have left it unfed longer than 4 days. I presume that I could … although it might be a bit spent by then. I have also read recently that a levain rather likes consistency in its feeding regimen. If it’s every week, one should try to keep to the same schedule whenever possible. I don’t know about that, but it’s an interesting thought. I have followed the directions for the PJ version starter culture exactly. On the third day when I went to give the final flour and juice feed I was greeted by a thriving colony of fluffy white mold. Any suggestions? I have dumped the whole thing out to start again. I used fresh ground rye flour (I know this isn’t necessary but I had some), kept the temp at pretty much a constant 80F (too high?) and used pineapple juice that I had in the fridge (not new, but still tasted good). I also kept the jar covered. Thanks for your help and great blog! In the very first few days is when the flour soup is the most susceptible to being overtaken by unwanted growth since no one is actually “in charge” yet. It may simply be some mould spores came in off the jar itself, just happen to settle in and take over. Not to worry. You did the right thing at this early stage to toss and start again – as opposed to tossing because there’s no (visible) activity which is what the pineapple juice method looks to avoid. So boil some water and make sure all your equipment is very clean and start again. There’s no particular reason this process shouldn’t work for you. Seems you just picked up an unwanted hitchhiker along the way this time. Each time you feed your starter (i.e. if feeding 3 times a day) before using do you have to take out equal amounts of starter and replace with equal amounts of flour water each time? It would depend on how much you start with, how much your recipe needs, and how much you want to have kept back at the end to start your next starter batch. Your best bet is to feed 1:2:2 ratio of old starter, water and flour. So 10 g old starter, 20 grams water (mix), 20 g flour (mix). As you can see, starting from 10 grams, you finish with 50 at the end of that feed. If you then use that 50 as your first part, you’d add 100 g water (mix well) and 100 g flour (mix again). Now you’re up to 250 g total. Here you’d check how much starter your recipe wants; say it’s 400 g (just an example). Obviously you don’t want to start that with 250 g old start since that would end with 1,250 g starter, far above the 400 you need. So at this point, you could cut it back to (410 ÷ 5 = 82) 82 grams of old starter and feed that 164 g each of water and flour. Now you’re up to 410, put aside 10 grams into a small container and give the remaining 400 g to the dough. Feed and keep that 10 grams (+20 +20) for the next starter batch. So let’s do some quick math. We start, again, with 10 grams of “old” starter in our initial feed. We add 20 g each flour & water and we have 50 total. Feed 3: 250 + 500 + 500 = 1250 g total. So we know that 10 g >> 1250 or 125 x increase. We can go backwards too. Your “go to” bread needs 635 g of starter so 635 ÷ 125 = 5.08 g of starter to begin. Obviously that 5.4 g is way too small an amount to handle, so you can start with 10 + 20 + 20 or 50g total, then cut THAT back to 25g for feed two. 125 + 250 + 250 = 625, just ten short of the required recipe amount. In this case, I’d say you’d be fine to feed a little more on that last one, say 270 each, getting you 665 g total, so 635 for the dough and 30 extra to get the new starter going again.